Clearly Susan loves to serve her Thanksgiving dishes painted in vivid dark colors of fall with fruits and vegetables. 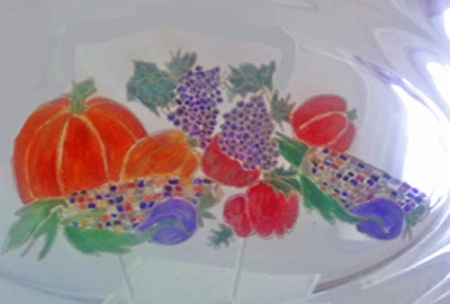 These vegetables and fruits are painted on a platter that matches the Thanksgiving plates that you would be so proud to display to your family and friends . The paintings of the fruits and vegetables are etched in gold that gives the color a pop.These Thanksgiving dishes look good enought to eat so go ahead and take a bite there is plenty to go around! See our matching Thanksgiving glasses and pitcher in the Related Items Tab, but also look at our Kitchen Items and Serving Sets that would look lovely hand painted in this design. Request the Thanksgiving Design in the Special Request Box if ordering one of these items.